If you're finding it hard to get your head around Brexit and what might happen if a deal can't be found, don't despair, because most people are. Even the politicians who are dealing with it day-in and day-out are suffering from head-melt. It gets so confusing and complex that at times, it can create spaghetti junctions in the most reasoned and seasoned heads. Perhaps one way of making sense of one of the most profound potential impacts for us here in Ireland is to watch a programme which will remind you why a border-free Ireland is worth fighting for. RTÉ Television recently broadcast a documentary called Shooting the Darkness - it's still available on the RTE Player. 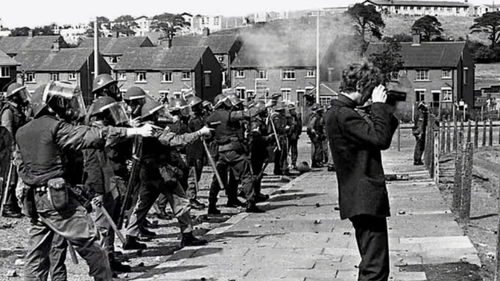 The programme chronicled the experiences of press photographers in Northern Ireland who started their careers taking pictures at agricultural shows, community events and the like, before the Troubles cast them into the role of war correspondents. A by-product of their fascinating stories of covering the terror of those days, was the distillation and crystallisation of the horror of it. Picture after picture showed the aftermath of bombings, shootings, torture and the raw grief and fear left in the terrible silent aftermath. The photographs those brave journalists risked their lives to take, showed how horrendous life was then - children growing up in fear, many bereaved, injured or left nursing a family member who was maimed in the name of a war with, it must have seemed, no end in sight. There is a doctor with his head in his hands crouching over a dead body; an older woman praying over the corpse of a man whose crime was his faith and a class of schoolchildren in tears of grief at the funeral of a classmate. It's not easy to watch, but Shooting the Darkness is so important for us all to see at this critical moment in our history. There is a sense, that perhaps in our relief that things are so much better now, many of us may have forgotten just how bad it was - now is the time for a shocking reminder, one which Shooting the Darkness provides. Political journalist Michael Brennan, writing in the Sunday Business Post suggested over the weekend that if it were shown on a British TV channel before the Brexit deadline, it might just get the message home about just how serious all of this is. Having watched Shooting the Darkness, it is hard to fathom how the Good Friday Agreement happened at all. So entrenched was the conflict that the signing of that historic 35-page document is truly a precious event and it is endlessly more precious because, largely, it worked. Reading it again in the last week, the simple language of respect, equality and a commitment to recognise difference and to agree to move forward solely on the basis of democratic consent, seems idealistic but so effective has it been, that there is an entire generation who only know peace on this island. We know that there are those who are unshakeable in their belief that Brexit will benefit the UK - whether it will or not remains to be seen, but the question has to be, is it worth creating a border on this island again? Could it ever be worth even the tiniest risk of a return to that awful gut-wrenching pain that this country has suffered time and again? The Good Friday Agreement became a victim of its own success. Because of the relative peace and calm in Northern Ireland since the latter part of 1998, very few seemed to consider the damage Brexit could do, by politicising the border again. One of the first times it seemed to hit the national consciousness in Britain was when British Labour MP Stephen Pound gave an ad hoc interview to Channel Four at his party conference last September. He succinctly said that even "a camera up a pole... will become a target" and that if such targets had to be defended by uniformed customs officers from the UK, then the "peace process is finished". Much water has flowed under the Brexit bridge since Stephen Pound said that, but that truth still remains. If the UK leaves the EU and takes Northern Ireland with it, fully out of the customs union and the single market, then this island will play host to an external frontier of the European Union. It will be our responsibility to ensure that goods do not enter the Republic and the rest of the EU from the North - it is that simple. Once the checks start, who knows where it will lead us. The Good Friday Agreement makes reference, a number of times, to the EU, perhaps most notably, when it says all sides wish to "develop still further the unique relationship between their peoples and close cooperation between their countries as friendly neighbours and as partners in the EU". Where does Brexit leave that? And where does Brexit leave the Good Friday Agreement?